It's a case of Mii-too with SEAT’s version of the Volkswagen up! city car. The small city car goes on sale next year, initially as a three-door, with a more practical five-door version to follow later in 2012. It's the third Volkswagen Group city car to be announced in recent weeks, following the Volkswagen up! and Skoda Citygo. As with the Volkswagen up! on which it is based, the Mii is small at 3.55 metres long, making it ideal for urban conditions. Despite its small size, the clever packaging maximises interior space, making it suitable for four adults. Power comes from a 1.0-litre engine in either 60PS or 75PS forms, and thanks to a low weight of 854kg it should be sprightly and nimble. The cleanest example, called the Mii Ecomotive, will be capable of covering 62.8mpg on the combined cycle and will emit 97g/km of CO2, making it free to tax and exempt from the London Congestion Charge. Both manual and automated manual transmission will be available. While it’s unmistakeably built on the same platform as the up! 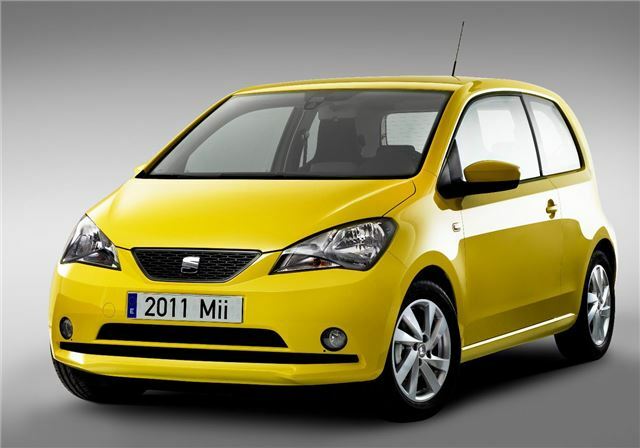 , the Mii has a few dynamic SEAT touches, including more angular headlights, and sportier bumpers and alloy wheels. A five-inch removable touch screen device will be available, which includes navigation, hands free phone system and controls for onboard functions. The Mii will be available in three trim levels in its home market of Spain, as well as with two styling enhancement packs to suit individual tastes. Basic models will be sparsely equipped, but will still come with Isofix child seat mounts and an adjustable steering column. For the likes of electric windows and central locking buyers will need to buy a higher spec model. UK specifications and details aren’t confirmed at this stage. For more information on the up! on which the Mii is based, click here.